CQWW CW contest is this w/e. Doing some work on aligning a K2 then will be in the contest for some of it anyway. M1K and qrp. M1KTA as SD7B Came 1st in SOA QRP Island DX 24hr Mix, 2nd globally in QRP category for island DX. BUT... I lost 27 percent of my claimed score through poor serial numbers! REALLY BAD! SD7B was a LOT of kit but if you take the solar panel and support stuff out it is a lot less. I had heavy duty poles (14kg for the three) as the wind was expected to get up. Light weight poles would not have cut it in the winds expected... I'm sure SOTA guys have experienced the same on some tops. This is about the most basic for an overnight stay... on a UK island. 10m pole, ex-mountaineering assault tent in bag along with antenna wires, guys and a ground screw hand for the pole. 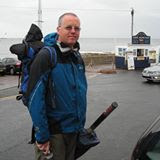 On my back rucksack containing rig, battery, food (petrol stove), water, wind up LED torch and log book. Believe it or not water and fuel to cook with are probably the heaviest items you need to carry before the radio kit. The tent is about 1kg and has been tested in 60mphwinds. The real test is if I cannot carry it all myself, from car to ferry/boat (this was a fishing boat), boat to island it doesn't go with me. I have been known to take a second rucksack with clothes, water, and food in, I will often refer to it as 'The PIG'. It is a faded red rucksack I was wearing when I fell in the alps a while back so it's a good luck charm and empty it doubles up as a sleeping bivvy bag as I fitted an extra liner to it. I'd love to downsize the kit to an ATS-3B for many reasons but as I make plenty of SSB contacts a CW only rig isn't right just yet and a KX3 suits, if quite a bit heavier. Maybe there might be a homebrew version in between out there somewhere? The drive in Sweden... there are 4 hours of this.... this is just a few mins. The TWO cars with the trip kit. Forgot mine so asked home to send me a copy and I added to blog just in case. 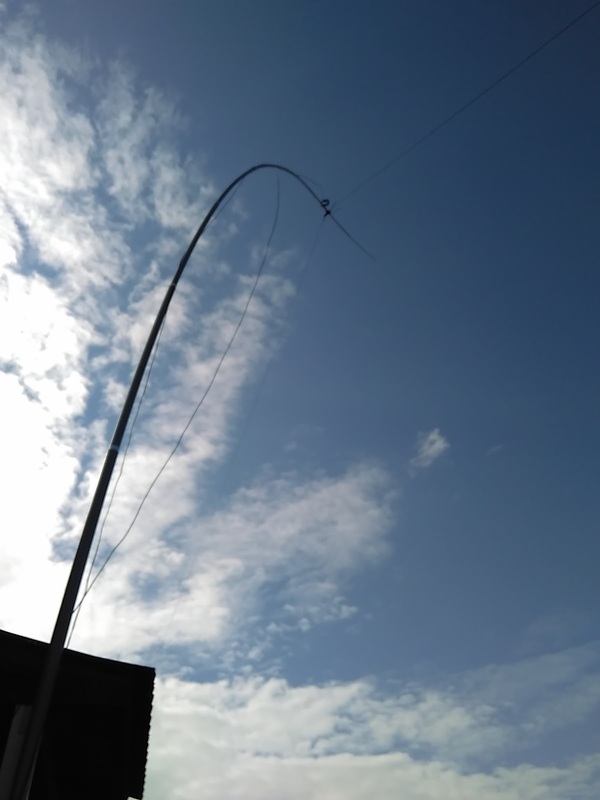 My antenna has seen loads of use and it works IF you use the little grey cells, it isn't a 3 el yagi or a decent dipole at 70 feet so if you think about how you use it you will be fine. 10-80m but will do 6m and 4m too and although I never did will also cover 2m... after all 1/4 wavelength is 19" but you can also get it to be 5/8 as well see instructions. You have a 48" whip 10 sections about 4" per section I'm sure the maths isn't too hard to work out. That said I have a length of yellow cord with knots tied in it for the lengths and tape with the length on them at the knots. Note the section with the BIG gap goes to the end closest to the radio or the tap points will be all messed up. Some more photos and videos from the island. Seriously nice sunsets... in the lea of the island the water is flat calm. The fallen VHF mast & antenna busted. Wind now firmly 180degrees opposite direction to Sat AM. SOA as using CWget and RBN. All the stuff on the quay for the boat trip back. The most obvious heating effect was above 8W on 6m and the heatsink kept the KX3 PA temp below 43'C, ambient was 25'C. At a pie and pint someone asked me how do I place the feeder when using vertical dipole by the sea, best coming directly out from centre for > 1/4 wavelength (found that out trial and error) rather than dropping to ground anyway a photo says it all. 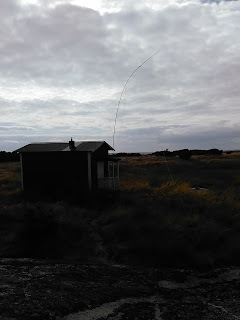 Stand at the vertical base and you are in marsh, actually 6" of stinky salt water but what a place for an antenna! Looking due west. That isn't a balun in the middle... I took the SHORT coax version (doh!) so that is a join with another length (yes you carry a few spares) ... at HF doesn't make any difference. 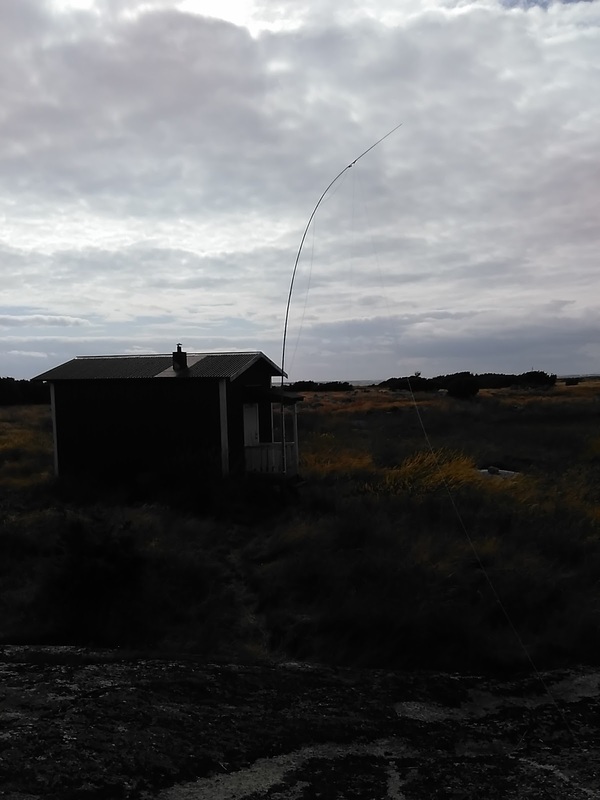 The coax is held in place and then tensioned with a prussic loop tied in this case to the shack (literally). Note THAT tie must be breakable/flex in wind and you will need to have some loose coax other side or if antenna goes over it may drag rig with it. Only one qso on 15m and 10m (to me was dead). 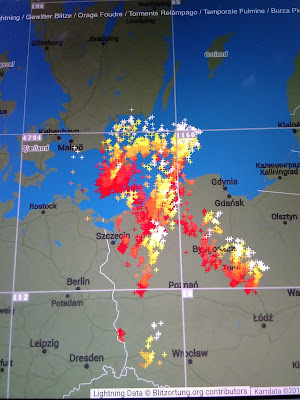 Lightening overhead right before off wasn't fun...... then a brief spell of 30+mph winds took out VHF mast then caused collapse of vertical dipoles.... put it all back up in the rain. Beat my own personal goal, last years qso and iota count, probably way off the pace but then qrp you tend to be. This was my log (before I check it for errors), couple stations gave nr too fast so logged 000. 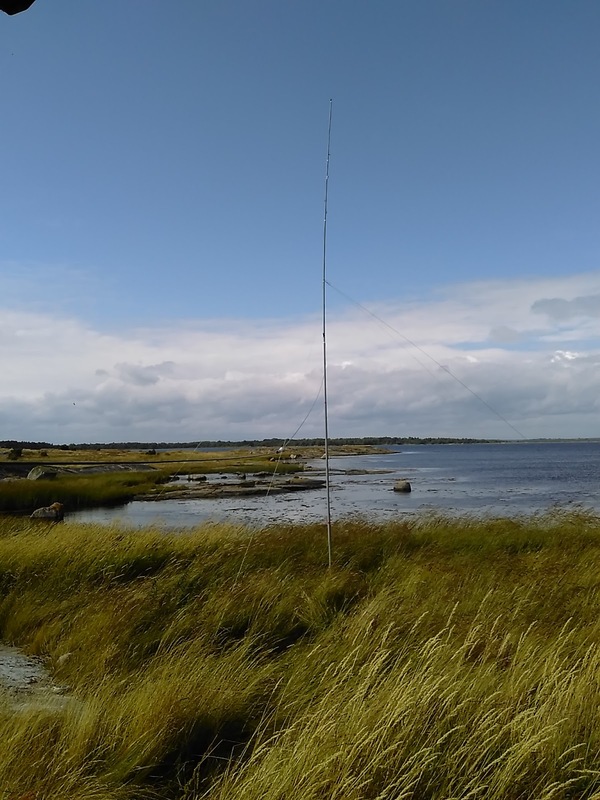 Some stations never completed QSO so F11 and sent cq again I guess UBN will tell story... almost all run little S&P, being qrp that was like flogging a dead horse. CATEGORY-ASSISTED: UNASSISTED -- not sure about this. CATEGORY-DXPEDITION: NON-DXPEDITION --- or this one. SOAPBOX: CW seemed hopeless except at 25 wpm or above. Not good for new amateurs. SOAPBOX: enough was spotted and multiplier pile up happened. For a bit anyway... should be past when IOTA contest starts. The antennas are all disconnected and on the ground. The boat almost got caught by the ferry wires! Turning for the army base where the quay is. Note the large coils of wire they are burying all the overhead power lines on this island at the moment. The qrp DXpedition pile. LArge flat box is the solar panel brought from UK. The Yagi is for 6m, have a 2el quad from M1BXF too. Note the no U boat parking sign!